You may consider them a blessing for your garden or the stuff of nightmares, but a spider sighting usually elicits some reaction. With 40,000 different species, spiders come in all shapes, sizes and colors. Some, such as the tarantulas, are hairy everywhere, while others, such as the black widow, appear to have hairless bodies. When you come across a spider hanging out in its web, instead of shrieking, take a moment to look him over. He'll have a prosoma, or cephalothorax, which is his front section. His eyes, jaws, feelers -- or pedipalps -- and four pairs of legs are housed in this one part. A narrow band, called a pedicel, joins the prosoma to his abdomen, or opisthoma. His spinnerets, which release silk for spinning webs, are on his abdomen. Before you note the daddy long-legs is missing a part, consider that he's not really a spider; a true spider has two body parts, and though the daddy long-legs is an arachnid, he's not a spider. Spiders are classified in a special group known as Araneae. Some people find that just thinking about a big, hairy tarantula will give them the shivers. The hair on his legs and body give this big spider a furry appearance -- and it's smart to be wary, as some tarantulas actually use special stinging hairs on their body, called urticating hairs, as projectile weapons. With a quick rub of the legs they can release a cloud of these hairs. 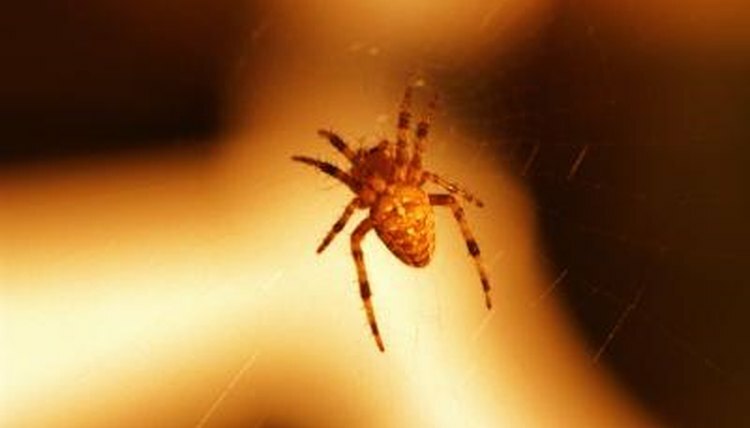 Other spiders, such as the black widow or the brown recluse, don't look quite as creepy because they look bare. However, put any spider under a microscope and you'll find hair on his legs and body. Spiders have trichobothria, fine hairs on their body that are critical to their survival. Since they don't have ears, spiders rely on trichobothria to help them hear. The tiny hairs are super-sensitive, able to pick up air movement down to one ten billionth of a meter. The hairs work independently to detect movement and filter out the vibrations of background noise, responding to sounds between 40 and 600 Hz -- between a bass's low tone and the sound of a car horn. By sensing vibrations through the hairs on their legs and body, the spider can feel when a fly approaches or if there's a predator to avoid. Those fine hairs do more than help the spider hear and feel; he also uses the trichobothria on his legs to smell and taste. He feels his prey with his hairy legs, confirming that it's edible. His hairy legs help him get around, too. If he's walking on a smooth, wet surface, every hair sticks to the surface, keeping him from falling. As well, the web-building spider sports a small tuft of hair to help him hang on to his web. About the only spider sense that doesn't rely on hair is sight. Just as the spider that looks hairless actually has hair, he also has eyes -- generally eight of them.